Is a Will Public Information After Death? Many people keep their last will and testament secret while they are alive, hidden away in a safety deposit box or a personal safe. But unless the will is superseded by another, it loses its private status when the testator dies. Whether the will belongs to a celebrity or your grandmother, it is usually open to public viewing after death. Courts use the terms "will" and "testament" interchangeably. Both terms refer to a document written and signed by a testator specifying who inherits his property on his death. States authorize different kinds of wills -- holographic, form and international wills, for example -- and prescribe rules for each. No matter what kind of will a testator drafts, it is not a public document during his lifetime. The statutes do not require the testator to show the will contents to anyone, even will witnesses. A testator executes a will according to state requirements. All states require a testator to sign a form will, for example, before witnesses. A properly executed will remains completely revocable by a living testator. If a will is revoked by an act -- crossing out the will -- or by a superseding testament, it remains private. When the testator dies, his latest will becomes effective and -- once filed in probate court -- becomes a public document. Probate is the court-supervised process of administering a will. The will usually names an executor; if not, the court appoints one. The executor steers the estate from the testator's death through property distribution -- collecting and appraising assets, locating heirs, paying creditors and liquidating property. The court requires reports from the executor to assure an honest and accurate accounting. Among the first documents the executor files is the will itself. Once the will is in the probate file, it is a public document that's available for viewing. Anyone can view a will in probate by appearing at the courthouse with either the probate file number or the name and date of death of the deceased. 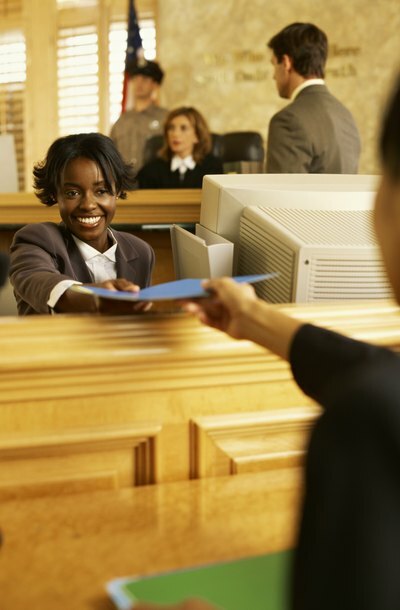 The court clerk locates the file and permits viewing either at the clerk's window or in a separate file-viewing area. The last will and testament is generally among the first documents in the file. Members of the public can obtain copies of the will by requesting a copy and paying a per-page fee. Wills are open to the public after they go into effect, not before. A will is the written description of how the person making the will -- the testator -- wants her property distributed after her death. Since states regulate wills, procedural requirements vary, but every jurisdiction treats wills as private during the life of the testator. Once the testator dies, however, her will moves into the public realm. TV shows sometimes include scenes in which an attorney for a recently deceased millionaire reads the will to the assembled relatives, causing shock and astonishment. However, no American jurisdiction requires a public will reading. Most people read a will at the court clerk's office. After a testator dies, the probate court reviews his will for validity and supervises its administration until the executor distributes estate property to the heirs. This is termed probate. Anyone can read or copy the will at the courthouse during and after probate.